Infographic Of The Day: Does Twitter Make Our Politics More Partisan? The ease of communication flowing on Twitter can be a force for good. But it also seems to be exacerbating our political polarization. We’ve heard for years and years that our nation’s politics are more polarized than ever, creating two parallel echo chambers that simply crank up the vitriol over time. And that’s plainly true, based on anecdotal evidence: At Tea Party rallies the idea that Obama’s some sort of Fascist/Socialist is dropped casually, as if it were beyond dispute; Hard lefties still drone on about charging Bushies with war crimes, oblivious to the fact that it would never happen in a million years. But we’ve never before been able to see exactly how polarized we’ve become. 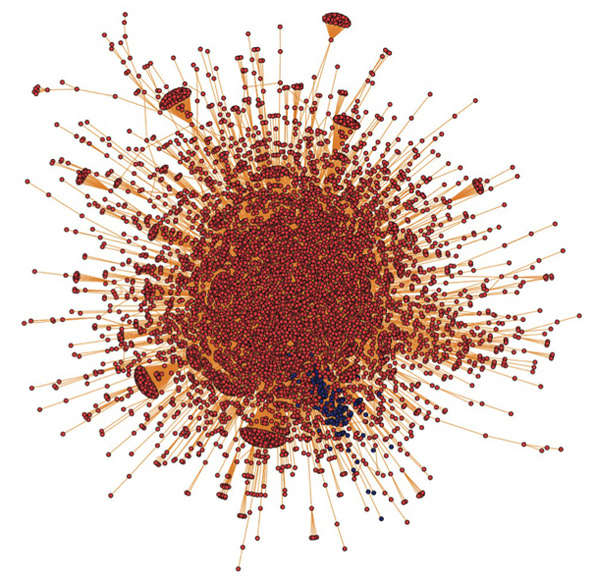 That is, until Twitter provided a wealth of data showing how people are interacting with each other. 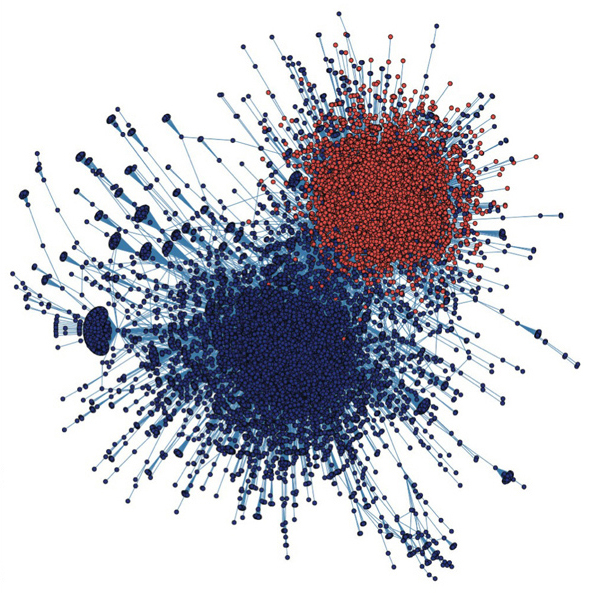 The red cluster is made of 93% right-leaning users, while the blue cluster is made of 80% left-leaning users. Which you might argue shows that left-leaning users are somewhat more aware of what the right believes, while the right exists in an alternate reality. (And indeed, this argument is often made by citing the parallel right-wing media that exists on Fox News and Breitbart. The most prominent such critic, of course, is Jon Stewart.) That may or may not be true — but it certainly doesn’t mean that the left is any holier. Just because you retweet something said by a rival doesn’t make the insularity any less pronounced; after all, you might simply be retweeting Glenn Beck and saying he’s a freak. But again, that might not mean much. While you might think this shows that @mentions could be forcing one side into dialogue, this might also just be reinforcing existing behaviors. Mentioning “@BarackObama” while saying that he’s a Nazi intent on eating your grandma doesn’t really expose Barack Obama to a viable alternative political view. Which brings us to the real question all this data leaves unanswered: Does a tool like Twitter actually help our political system by increasing the flow of dialogue? Or does it simply amp up polarization? Think of it like this: Previously, we used to have a national media, including newspapers and network TV, which produced a fairly unidirectional message. It was like we were all forced to sit in on the same lecture, delivered by the big responsible adults who weren’t supposed to favor either side. Today, we can now ignore those adults and break off into whatever little subgroups we like. We can easily listen to only the people we agree with, and the charts above show that this is in fact what seems to be happening. And that can’t be good for our political dialogue. For another project from the same group at Indiana, check out this post on Truthy, a service tracking malicious Twitter memes.